Returning to Italy from a foreign country, especially a country as captivating as Thailand, there’s the risk you may feel a bit lost. I had got used to being surrounded by the smell of hot soups, to feeling my eyes sting with spices, to hearing the hum of the markets from dawn; here in Italy, at least for the first few days, I felt like a stranger. Travelling is a personal experience, and certain places resonate so strongly with you that you feel completely at home even 6000 miles away. To cure my nostalgia, I went to Milan to see Eugenio Roncoroni who, together with Beniamino Nespor, is the kitchen manager of the Al Mercato Noodle Bar, a restaurant in Viale Bligny serving noodles and various Asian specialities. I was ready to find out where to get kaffir lime leaves in Milan, and instead I found myself gaining in-depth understanding of what Thai cooking is and learning that some of the things that I saw in Bangkok will have great difficulty ever becoming established here in Italy. We begin with the shopping: our trip starts at the covered market in Piazza XXIV Maggio, recently renovated and transformed into a one-storey, cold and impersonal building. The warmth is provided by the traders, divided into geographical areas: South America here, Asia over there, and Italy has a place too. 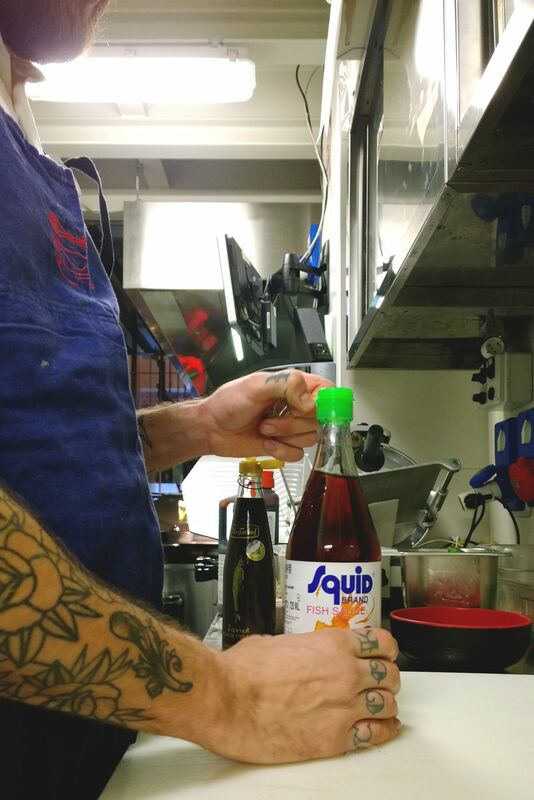 Eugenio takes me to buy Fish Sauce and chooses the Squid Brand sauce: fish sauce is a bit like the Italian salted anchovy sauce, in that it is produced by pressing fermenting fish and salt over a period of around 18 months. The result is an almost repellent-smelling sauce that is nonetheless fabulous for marinating fish and flavouring numerous dishes. 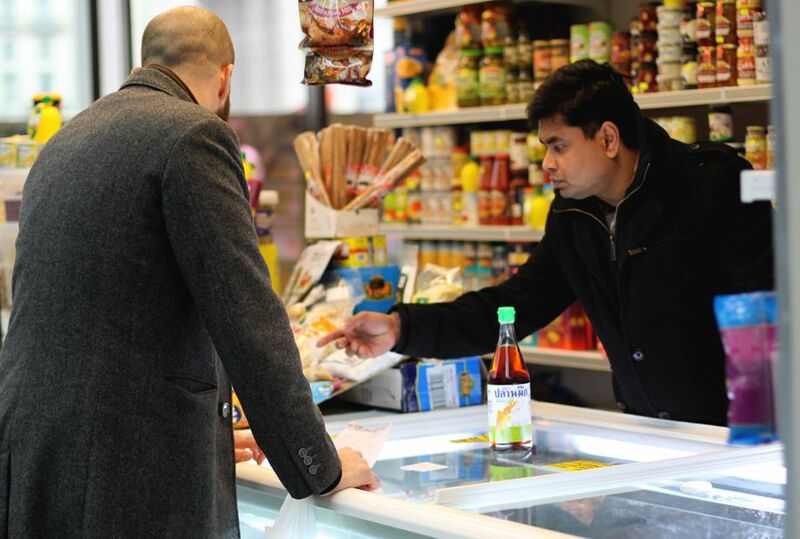 We end up talking about markets in which you can get something to eat. In the same one in Piazza XXIV Maggio, there is the Mangiari di Strada butcher’s, a place where the distinguishing feature is high quality street food. I was already imagining a healthy kebab for supper, but then I find out that the market is closed in the evening; in Italy, it’s difficult to meet the demands of people wanting to eat at all hours of the day, as happens elsewhere in the world. And yet the markets should be the ideal place for it, as we learn from the markets in Thailand. 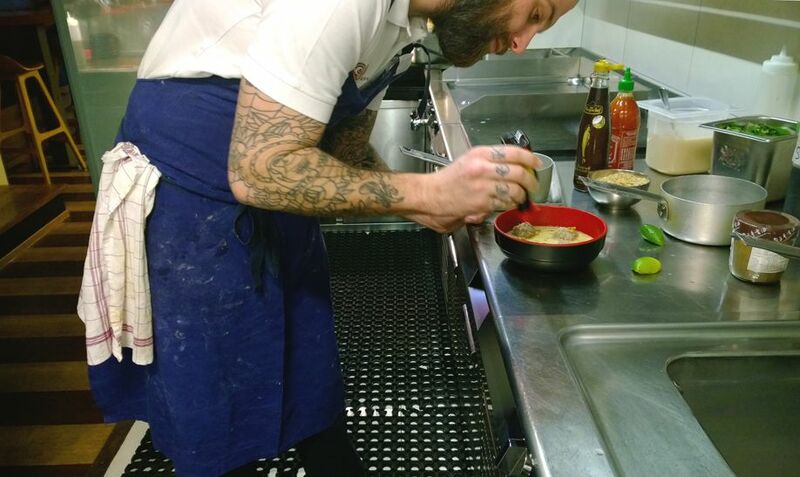 Our day continues in the Al Mercato Noodle Bar kitchen, where Roncoroni is preparing Congee, a Thai dish consisting of a rice porridge, to which are added pork meatballs, spring onions, egg and spices. 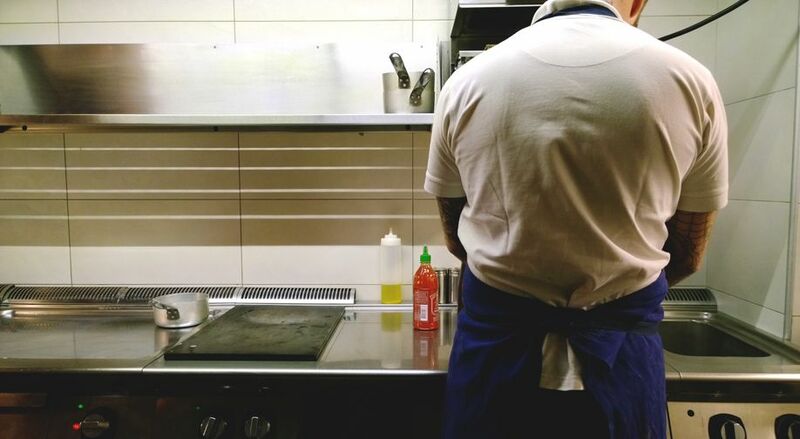 Once in the kitchen, my first photo is of his back. When I think of a chef’s work, I always imagine great physical, and mental, endurance, considering the hours that he or she has to spend in the kitchen, sacrificing free or family time. The unseen face, and the uniform, create a single figure that is representative of a whole category. The rice porridge for the Congee is prepared: the (jasmine) rice is rinsed many times and then cooked in a chicken stock with ginger and salt until it is reduced to porridge. The first lesson is about ginger, that Roncoroni slices up with the skin to use in the meatballs: the skin, he tells me, contains lots of nutrients, and he also doesn’t waste any part of the product. If, as is the case here, the ginger is to be used in a mince, you just need to make sure it is very finely sliced. With the spring onions too, use the green part, the bit furthest from the root: it’s less strong and more suited to Western flavours. To the mince, he adds the spring onion, ginger, eel sauce, a bit of white flour and one egg. 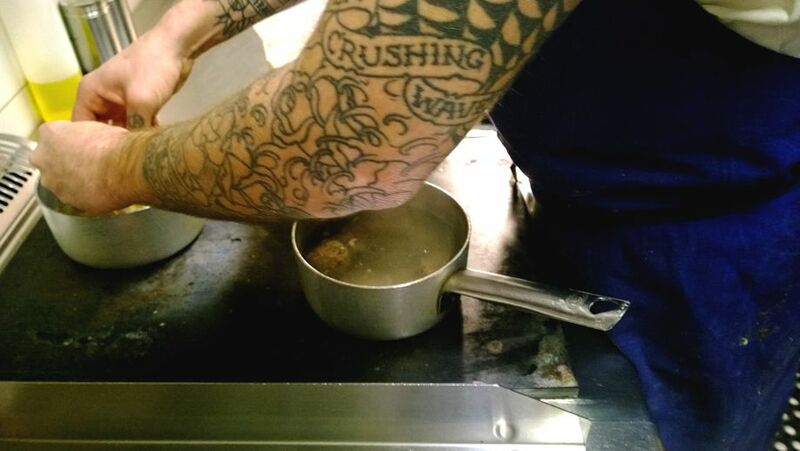 Roncoroni’s tattoos are numerous and beautiful: on his right hand, he has COOK. The easiest shot in the world is him picking up the Fish Sauce, with his hands in the foreground and the ingredients left in the background. For the more inquisitive of you, behind the Squid Brand bottle, there is another fish sauce of the Megachef brand, “the Rolls Royce of fish sauces”. Once well-mixed, the ingredients are shaped into meatballs, which are then cooked in boiling water for 5-6 minutes. In the meantime, I ask Roncoroni questions on Thai cooking, and I discover that coconut milk, often used in curries, increases in sweetness by prolonging cooking time. Although many recipes have short cooking time, the world of Thai ingredients is made up of single, clear-cut flavours which removed from or added to a dish can alter it radically; it is a balance in continuous transformation, an incredible game of stratification. 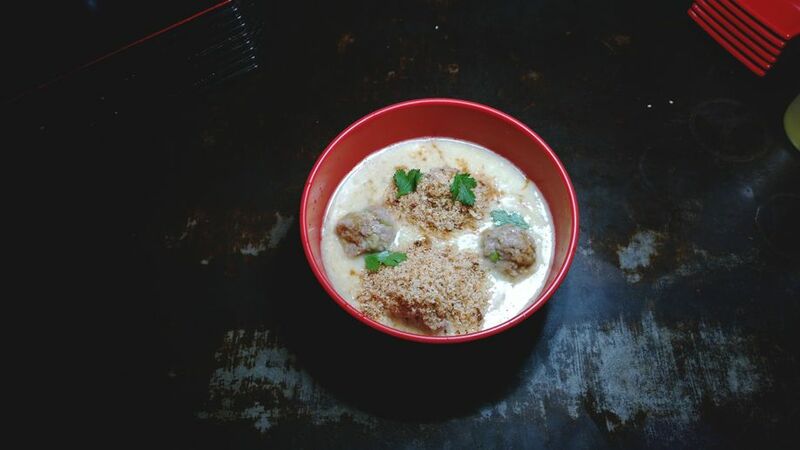 Whilst the meatballs are cooking, Roncoroni breaks an egg and adds it to the rice porridge; when the albumen turns white, the mixture is stirred together. In the image below, I captured a detail of the cooking, placing the pan on the heat and the griddle, a reminder of street food as it is cooked in Thailand. 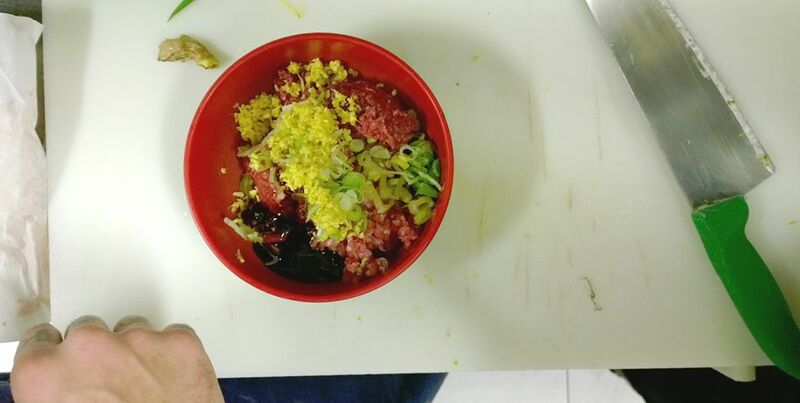 The dish is then put together: the rice and egg porridge is poured into a bowl and the meatballs are placed on top; then a crunchy mixture of ginger, panko and seed oil is added and the dish is seasoned with coriander, fish sauce, soy sauce and Siracha (a spicy chilli and garlic sauce). In the image below, I wanted to capture the chef and his dish in a close-up of him at work. Sauces are often found on the table when you eat Thai street food. If you’re wondering why, well, it’s because it’s a habit they’ve picked up from colonising countries. Often, you go to the other side of the world without realising that the world moves faster than we can get there; so, in Asia we find American customs, in Africa we find those of the French and so on. I’m waiting for the time when Italy will be colonised by the East, if only to be able to eat a hot noodle soup at 4 o’clock in the morning. I leave you with an image of the finished dish; needless to say, it was delicious. For the photo, I was lucky enough to have a lamp whose light shone on the dish from above. Dark backgrounds are one of the recent trends in food photography, which lend a more dramatic effect than a pale wood or pastel backcloth.